Priest by day, writer at odd times of the day and night, I live with a small green parrot called Tilly because the upkeep for a dragon is beyond my current budget. Plus I'm responsible for making good any flame damage to church property. I love 'Doctor Who', landscape photography, single malt whisky, and my job, in no particular order. When I'm not looking after a small parish church in the Midlands (England) I like to go on far flung adventures to places like Peru, New Zealand, and North Korea. 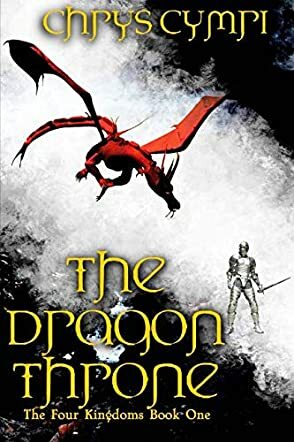 The Dragon Throne (The Four Kingdoms) by Chrys Cymri is a story that begins with Princess Fianna as heir to the Dragon Throne. Her elderly father brings Marissa into the household. When Fianna finds out that her father is about to marry Marissa for the purpose of possibly giving him a son, Fianna flees the castle and seeks refuge with her aunt. Four years have gone by while she's been away. Her best friend proposes marriage to her just as news of her father's demise comes. Before she can give an answer, she is whisked away and returns home in secret. Her stepmother is with child, one that is yet to be born. For now Fianna is the rightful heir, and is willing to guide the child should it be a male. The court does not know that she has already met a dragon. Ms. Cymri does an amazing job of setting the stage for the coming events; from the intricate ways of politics to the humbleness of our heroine. This story moves along at a good pace, although slower at times as Chrys lays down the necessary foundations of the overall plot. She has created a majestic world of wonder that in my opinion rivals the works of Margaret Weiss. The Dragon Throne is a captivating story from the very beginning, and she reveals pleasant surprises throughout. I loved this book from beginning to being left hanging at the end? Well done!